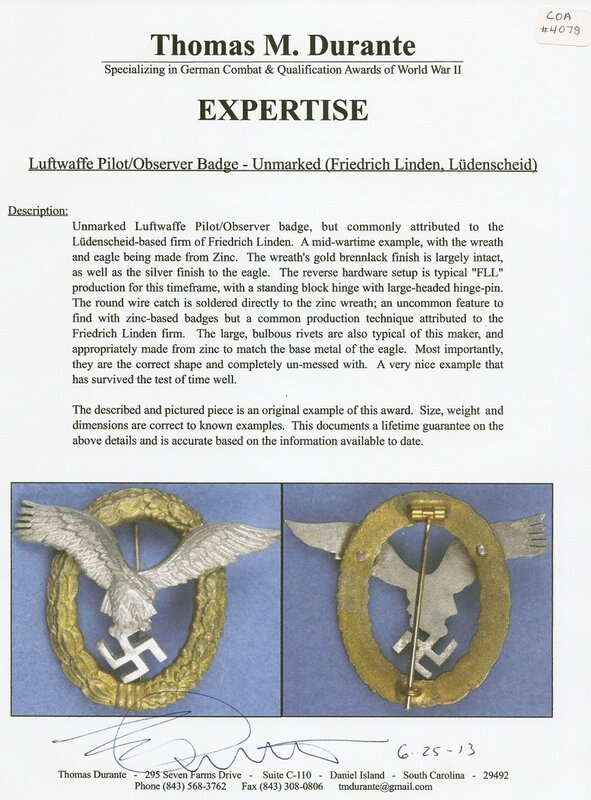 Unmarked Luftwaffe Pilot/Observer badge, but commonly attributed to the Lüdenscheid-based firm of Friedrich Linden. A mid-wartime example, with the wreath and eagle being made from Zinc. The wreath's gold brennlack finish is largely intact, as well as the silver finish to the eagle. The reverse hardware setup is typical "FLL" production for this timeframe, with a standing block hinge with large-headed hinge-pin. The round wire catch is soldered directly to the zinc wreath; an uncommon feature to find with zinc-based badges but a common production technique attributed to the Friedrich Linden firm. The large, bulbous rivets are also typical of this maker, and appropriately made from zinc to match the base metal of the eagle. Most importantly, they are the correct shape and completely un-messed with. A very nice example that has survived the test of time well. The described and pictured piece is an original example of this award. Size, weight and dimensions are correct to known examples. This documents a lifetime guarantee on the above details and is accurate based on the information available to date.